The issue of changing social values, cultural diversity and tolerance is at the heart of the work of those of us engaged in higher education. Whether we are teaching in class, online or in a blended way, how we engage learners and work with different groups within our colleges, universities and apprenticeship programs reflects our values and our understanding of what diversity and multiculturalism look like. 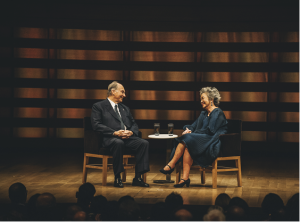 This is why the Aga Khan’s insightful and powerful address, accepting the Adrienne Clarkson Prize for Global Citizenship last Wednesday, September 21st is so important. Earlier this month, posters appeared on an Alberta university campus with an image of a Sikh in a turban sending a message that this man “should go back from where you came from”. These provocative posters did provoke a response – a very positive one. Students and staff took down the posters and replaced them with messages of care, welcome and concern. Across the country, many individuals both condemned the posters but, more importantly, responded by reinforcing how welcome those of different ethnicity, religion and social status were to Canada and how Canadians go out of their way to ensure that new arrivals to this country feel welcomed, cared for and connected. But Canada is good at both living with complexity and responding to challenge. The way communities responded to the influx of Syrian refugees in the last twelve months, the way Canadians spontaneously respond to natural disasters around the world, the spirit of voluntarism and engagement we see across Canada are true Canadian values. These are the values which Adrienne Clarkson captures in the work of the Institute of Canadian Citizenship and which John Ralston Saul has written about and championed for many years, especially in his book A Fair Country: Telling Truths about Canada. As we look to the future – one in which interconnectedness will grow, the movement of people will be more extensive and the need to find ways of embracing diversity will become more demanding. We need to more fully explore the idea, suggested by the Aga Khan, that we each will have “layers of overlapping identity”. These include faith, ethnicity, language, gender, age, community, profession, social networks, pastimes and passions. “This is why I would emphasize, as Adrienne Clarkson has always done, our responsibility to improve the quality of life in places throughout the world where that quality is unsatisfactory – fighting poverty, improving health and education, expanding opportunity – as the first manifestation of a healthy pluralistic ethic. Pluralism means responding to diversity not only at home, but on a global basis, creating genuine “visions of opportunity” wherever constraints or reversals are in the air. More of our students need to spend more time discovering and understanding different cultures around the world – the effects of which can be transformative. More of our colleges, universities and skills-based programs need to be recognizing and enhancing foreign credentials and learning, need to be open to global partnerships for learning. Multiculturalism should be included as a core subject matter and not an issue that is studied by a small number of arts, social science and humanities students but as a core subject for all to better understand. “… affirming social solidarity, without imposing social conformity. One’s identity need not be diluted in a pluralistic world, but rather fulfilled, as one bright thread in a cloth of many colours”. Our schools, colleges, universities and apprenticeship programs should be role models for intercultural engagement, empowerment and respect for pluralism. These institutions should be places which act as role models for the ways in which pluralism, respect for diversity and multiculturalism become sources of inspiration, scholarship and wisdom for all engaged in learning. The Aga Khan’s well crafted thoughts, coupled with the ongoing work of the Institute for Canadian Citizenship and other organizations and individuals focused on prizing diversity, should be an inspiration for all engaged in higher education. Pluralism, diversity and multiculturalism need to be at the heart of our teaching and learning.